Sewing Room | Habitat | Kids VT - small people, big ideas! Caitlin Betsy Bell got her first sewing machine when she was 6 years old. Her mom sewed a lot, and her two older brothers were involved in a 4-H quilting group. Bell was eager to get in on the action. In middle school, she made little purses and cards by hand and sold them for a Girl Scouts fundraiser. 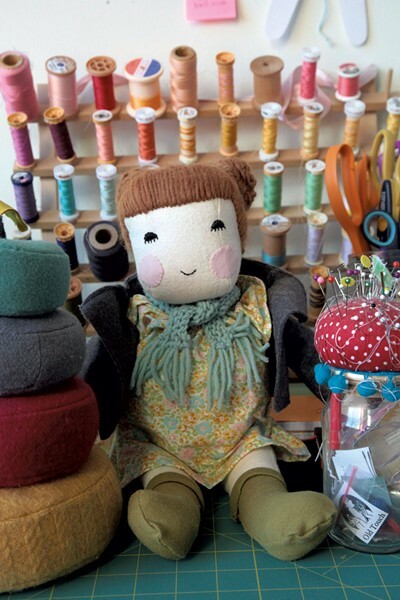 In high school, instead of getting a waitressing or babysitting job, Bell began hawking her handmade baby toys and puppets at local holiday markets and online. She's been growing her eponymous business ever since. Now the 25-year-old Savannah College of Art and Design grad is making baby clothes — inspired by the September birth of her daughter, Estelle. In December, she started selling them at holiday fairs. Later this spring, her goods will appear at Winooski's Birdfolk Collective, a soon-to-open store on the roundabout specializing in handmade items. 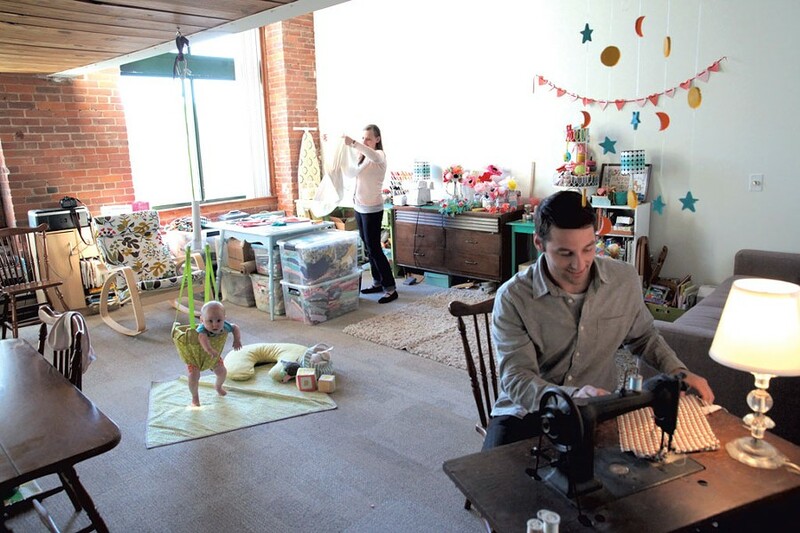 Bell's baby-wares business now occupies nearly half of the first floor of the Woolen Mill apartment that she shares with her fiancé, Jesse, in Winooski. Using Estelle as a model helps Bell design clothes that really work for babies. She makes easy-on, easy-off leggings with heart patches on the knees. Some of her tops have snaps all the way down the front so they don't have to be pulled over the head. Estelle benefits, too. "I have probably more quilts than she'll ever need," Bell says. A fabric doll with yarn hair, a flowered dress and a knitted scarf was so time-consuming to create that Bell decided not to make another. "It's Estelle's doll now," Bell says with a smile. She also made Estelle's crib sheets and most of her clothes. "It's fun having a little muse," Bell says. A vintage metal plant stand holds some of Bell's colorful toys, made from all-natural fibers. 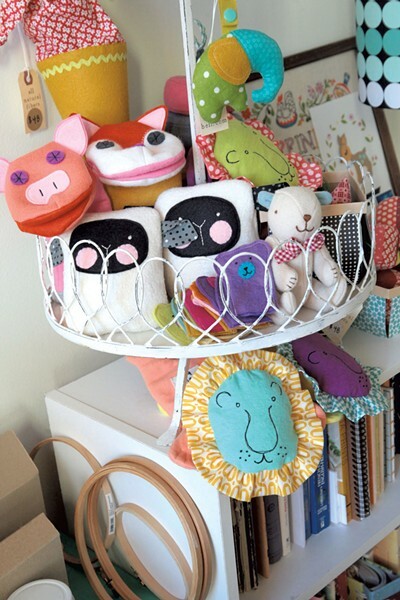 A basket on a nearby coffee table contains more cute creations, including her best-selling toy, a smiling cloud with rainbow fabric strips hanging down. Bell loves visiting fabric stores when she travels. Purl Soho in New York City is a favorite. Locally, she likes nido in Burlington. Bell uses a Viking sewing and embroidery machine, which she got as a high school graduation present. She finishes edges and hems with her Brother serger. The price of Bell's baby goods run the gamut from $12 for a hat or finger puppets to $88 for ring stackers. View and shop for Bell's creations at caitlinbetsybell.com. Bell teaches simple sewing to kids two afternoons a week at the Pierson Library in Shelburne.